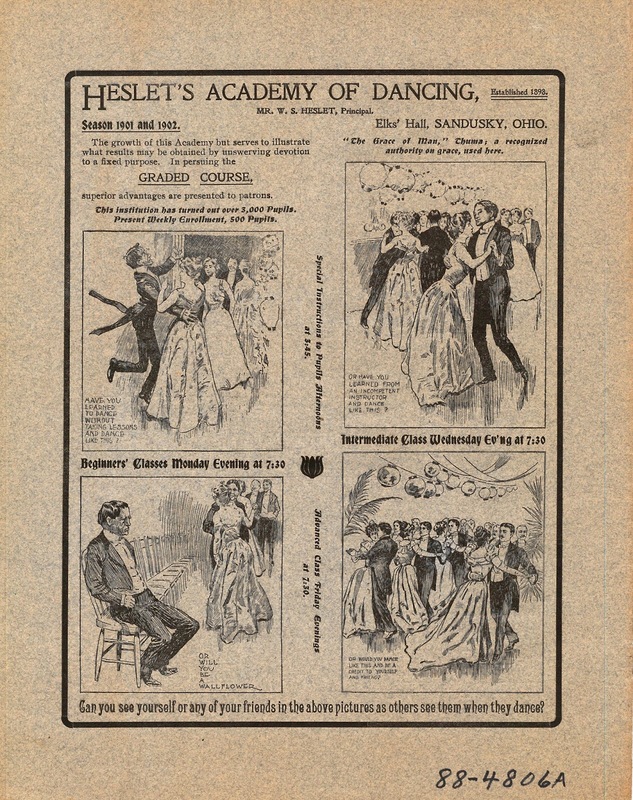 An article in the “Twenty Five Years Ago” feature of the Sandusky Star Journal of February 26, 1932 featured an announcement which had appeared in the February 26, 1907 issue of the Star Journal. 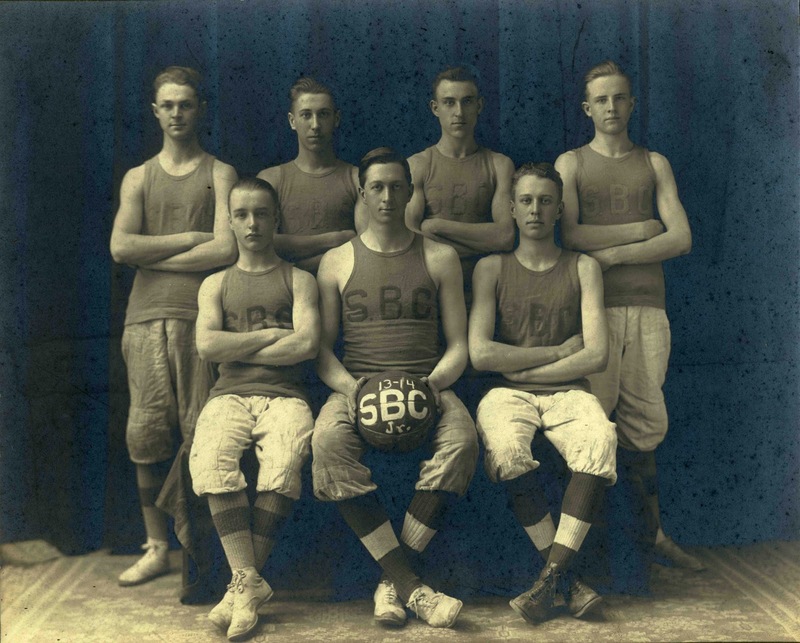 Bradford Mills, after conferring with G.A. 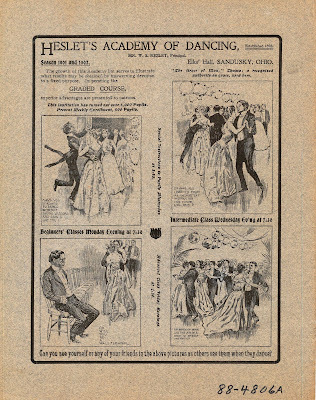 Boeckling, signed a contract to provide eight weeks of comic opera for the 1907 summer season. 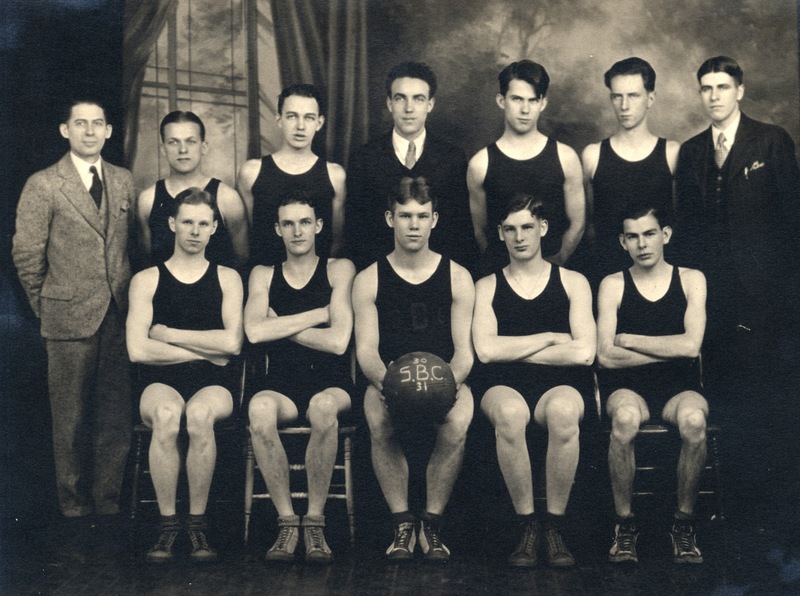 Mr. Mills was the director of the Toledo Conservatory of Music at that time. 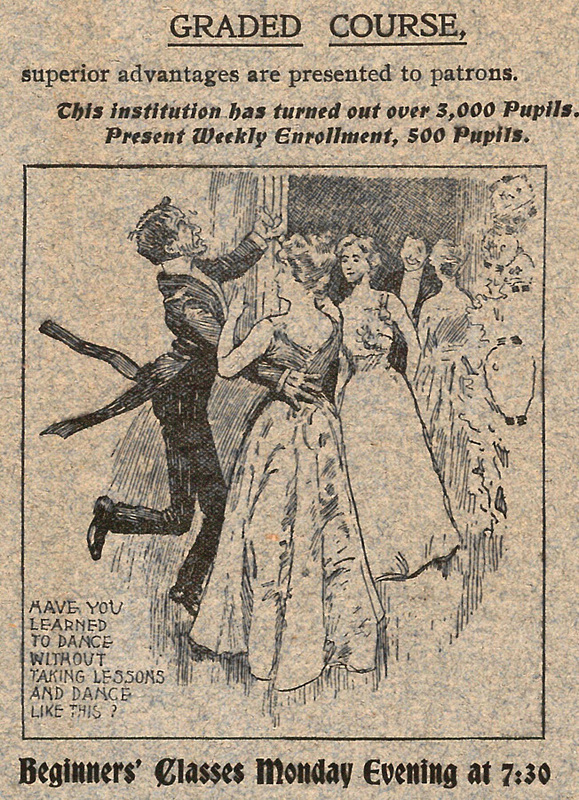 On August 16, 1907, the newspaper stated that “The Colonial Opera Company, under the direction of Bradford Mills of the Toledo Conservatory of Music will close a most successful engagement at the Cedar Point Theater.” One of the comic operas performed at Cedar Point in 1907 was Lecocq’s Girofle-Girofla. 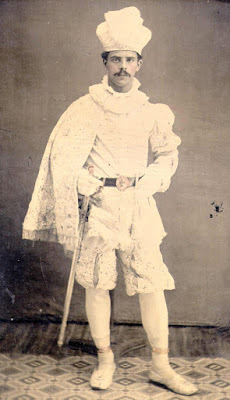 The opera was about the twin daughters of the governor of a Spanish province who was in financial difficulties. 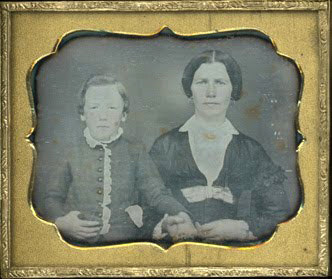 Miss Juanita Rush of Toledo, Ohio portrayed both the daughters. 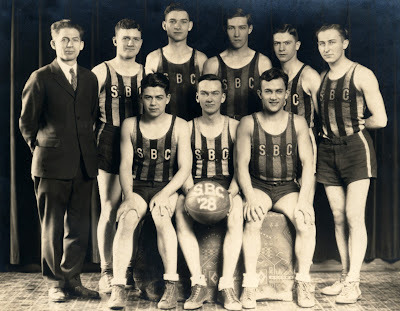 Costumes for the production were supplied by the Toledo Conservatory of Music, and the piano used at Cedar Point was supplied from the Starr Piano Company of Toledo. 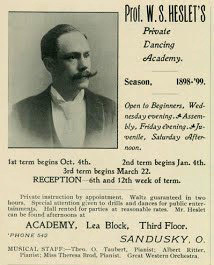 Opera didn't last very long at Cedar Point, however, because people were more interested in vaudeville at that time. 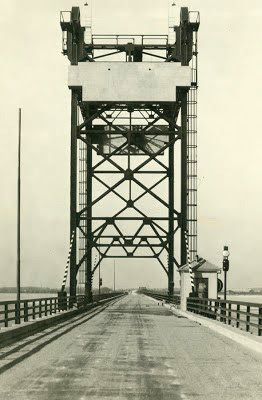 This advertisement appeared in the February 1, 1929 issue of the Sandusky Star Journal, on the day before the old Sandusky Bay Bridge was dedicated. 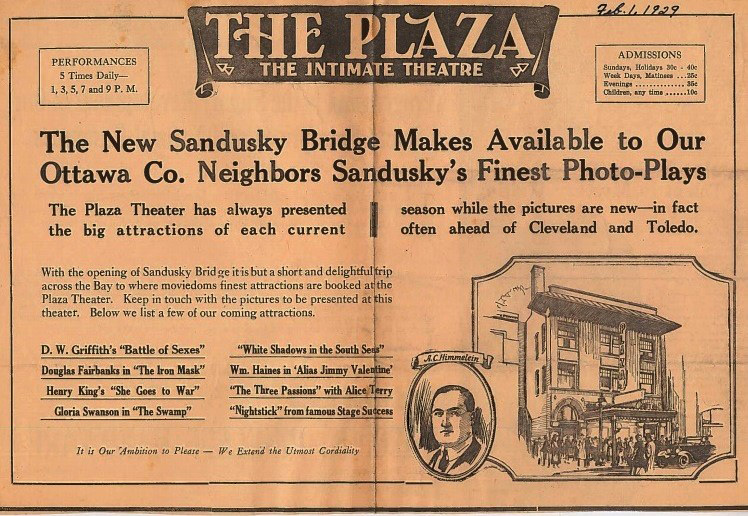 The ad pointed out that with the opening of the bridge across Sandusky Bay, Ottawa County residents could now easily travel to the Plaza Theater on Jackson Street in Sandusky, Ohio. 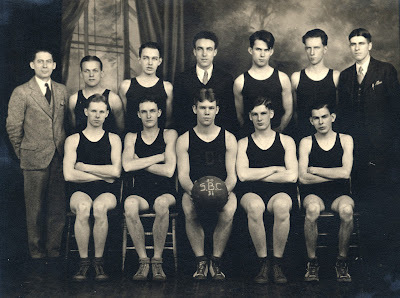 The manager of the Plaza was A.C. Himmelein, the nephew of John A. Himmelein, who was also connected with the entertainment industry. 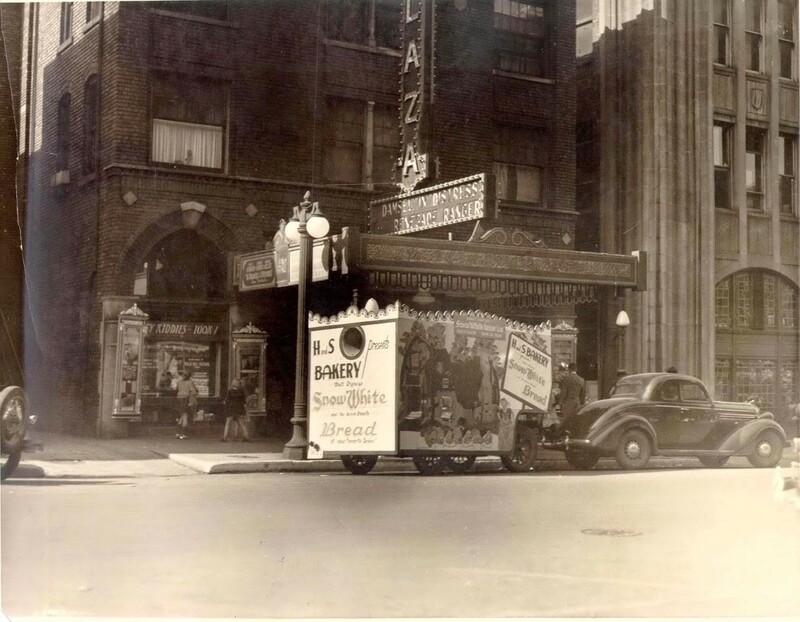 Tickets to the Plaza ranged in price from ten cents for children to forty cents for adults on Sunday and holidays. 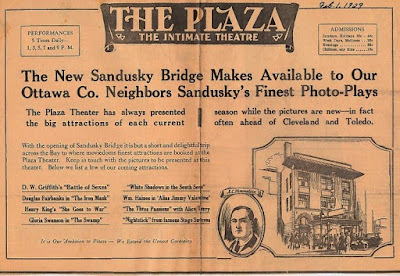 According to the advertisement, Sandusky’s finest “photo-plays” were shown at the Plaza, sometimes even appearing in Sandusky before they were shown in Cleveland or Toledo. 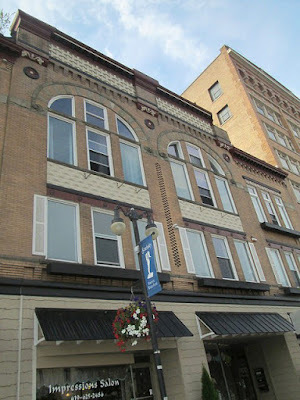 The Plaza Theater opened in 1914 as the Ivonhoe, and was located in the 200 block of Jackson Street, next to what is now the Sandusky Register building. 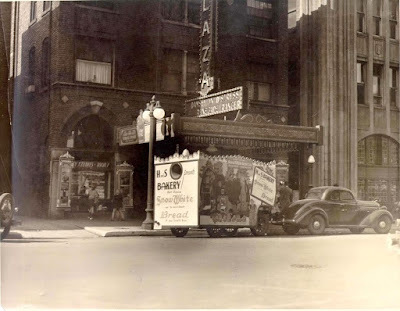 The theater was razed in the 1960s. 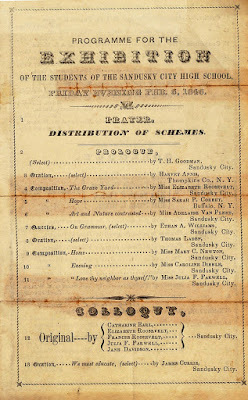 On Friday evening, February 6, 1846, students of the Sandusky City High School gave an Exhibition. Orations and compositions were presented throughout the evening. 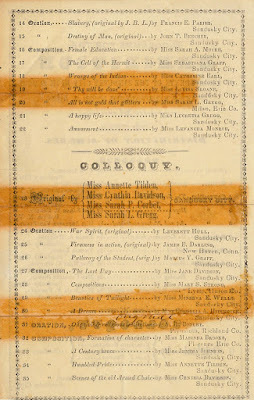 Julia Farwell, the daughter of Sandusky’s first Mayor, Moors Farwell, gave a composition entitled “Love thy neighbor as thyself.” An oration on the topic of slavery was presented by Francis E. Parish, the son of well-known Sandusky lawyer and abolitionist, F. D. Parish. Mr. F.D. 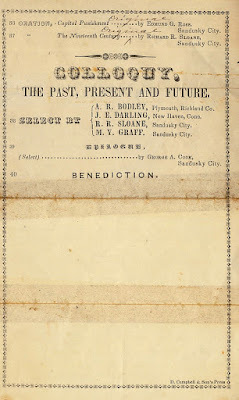 Parish had been elected as one of the school directors in 1838. 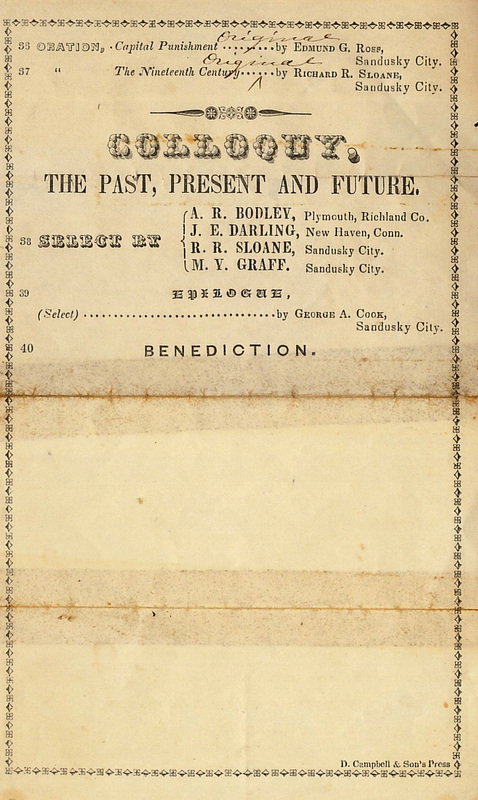 It is interesting to note that the program for the Exhibition was published by D. Campbell and Sons, who also published the local newspaper in Sandusky. 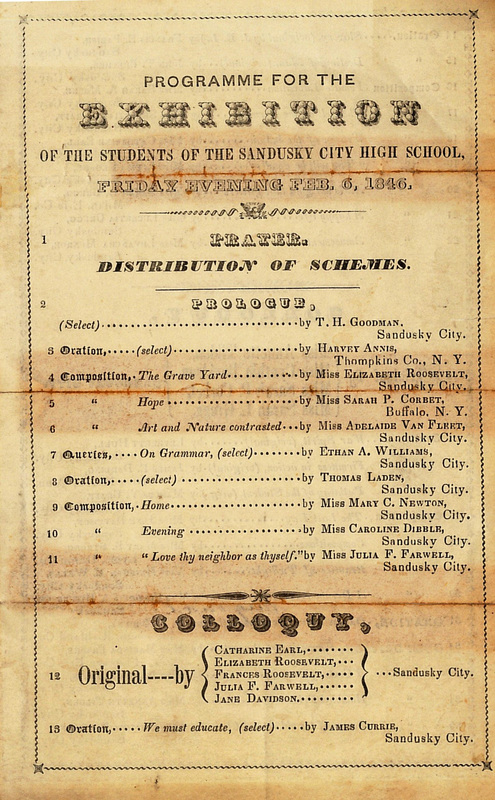 To read more about the early history of schools in Sandusky, see “Local School History of the City of Sandusky, from 1838 to 1872 Inclusive,” written by M.F. Cowdery in 1876, and housed in the Schools Collection of the Sandusky Library Archives Research Center. 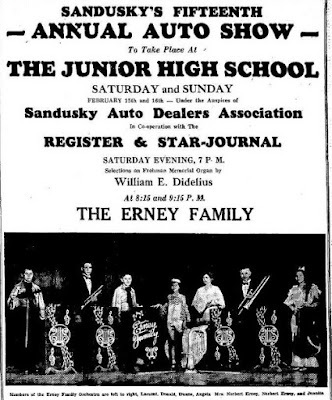 Sandusky’s 15th Annual Automobile Show was held at Jackson Junior High School on February 14, 15, and 16 in 1936. (The photo above is undated, but it was from the decade of the 1930s.) Details about the Auto Show in 1936 were featured in the Sandusky Register and Star Journal newspapers, now available on microfilm at the Sandusky Library Archives Research Center. 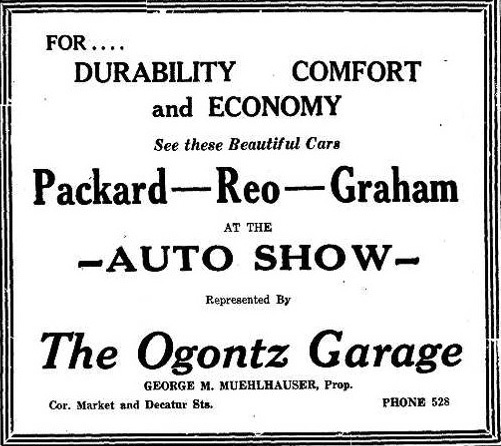 Thirty new cars were on display, and there was entertainment and door prizes each night of the show. Admission fee was fifteen cents. 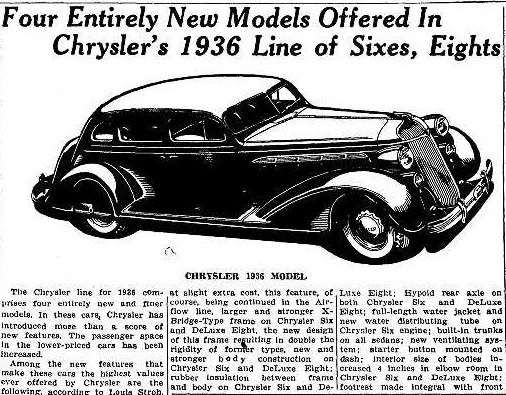 The new Chrysler automobiles in 1936 had several new features, including more passenger space, stronger body construction, and a new ventilating system. 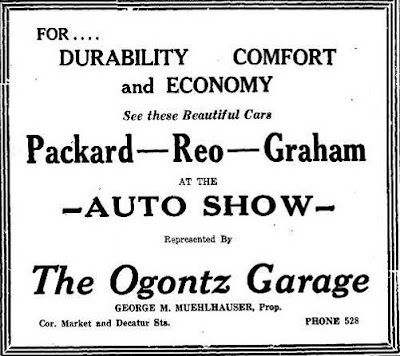 Some of the models of cars on display from the Ogontz Garage are no longer made today. 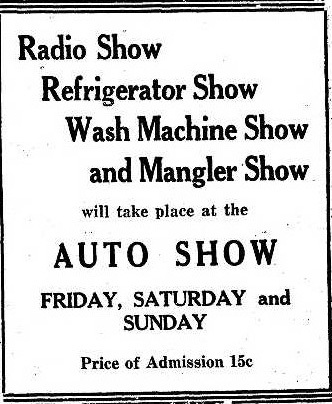 Appliances were also on display at the Auto Show. 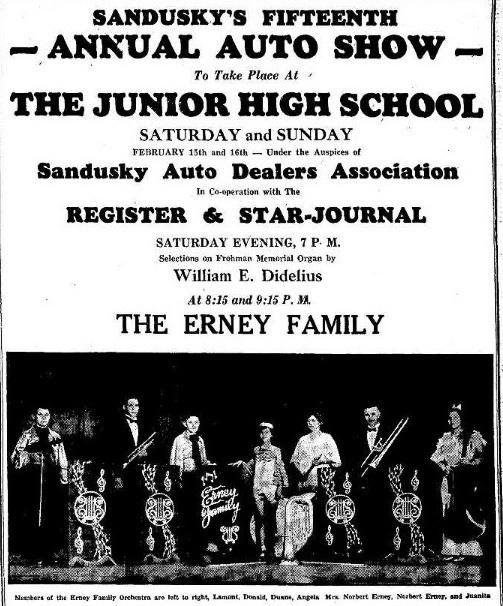 The Erney Family had two performances during the Auto Show. 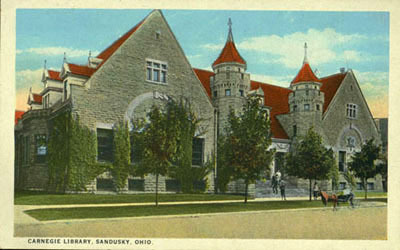 Visit the Sandusky Library Archives Research Center to learn more about the history of Sandusky and Erie County, Ohio. 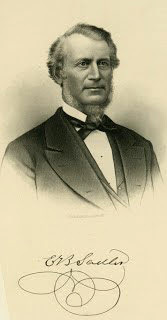 The Honorable Ebenezer Brown Sadler was Erie County Common Pleas Judge from 1845 to 1851, and he also served as Mayor and Postmaster of Sandusky, Ohio during his long years of public service. 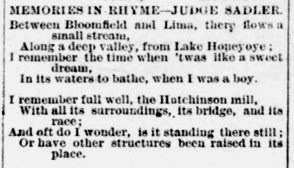 Between Bloomfield and Lima, there flows a small stream. In its waters to bathe, when I was a boy. 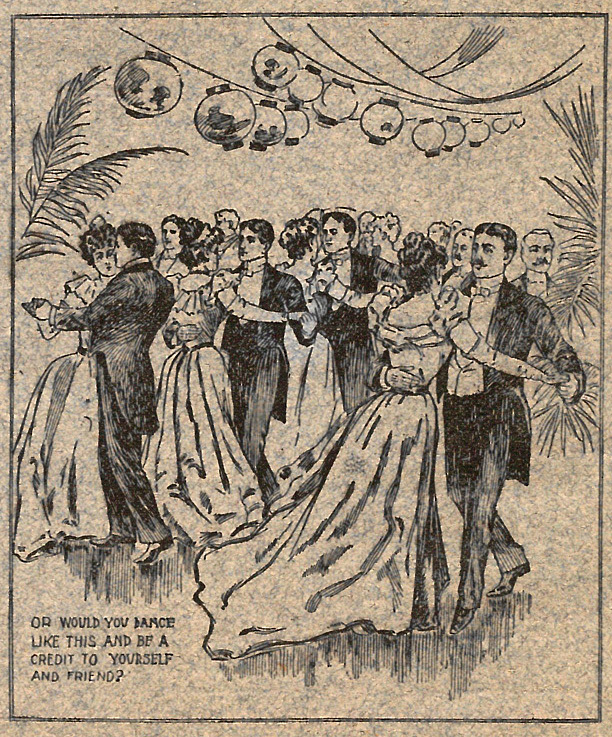 Or have other structures been raised in its place. Then there’s old Jockey Hill I can never forget. 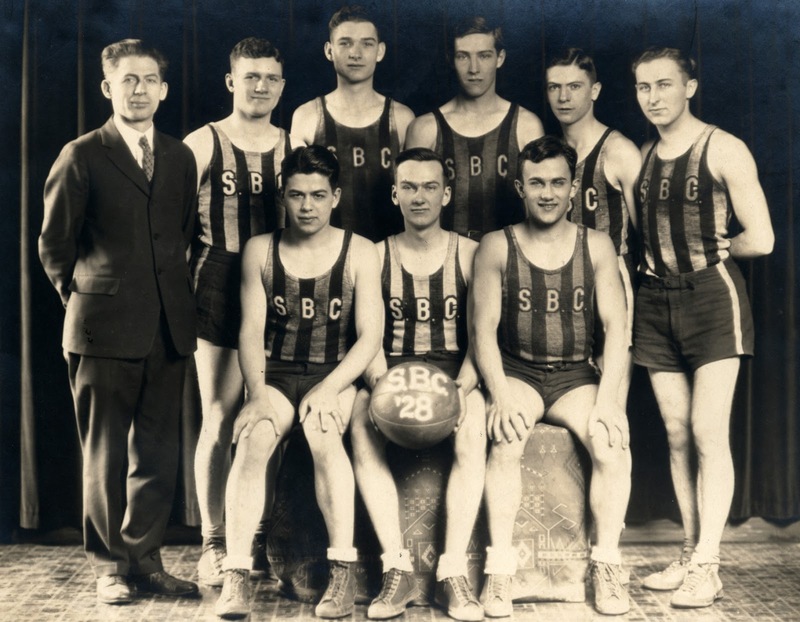 Lovingly smiling, sitting close by my side. And left me to travel life’s journey alone. To drag out a life in this valley of tears. When sitting and musing in my office alone. I ask myself often, but no mortal can tell. And some to condemn, I am sorry to say. And God’s Golden Rule should be well understood. 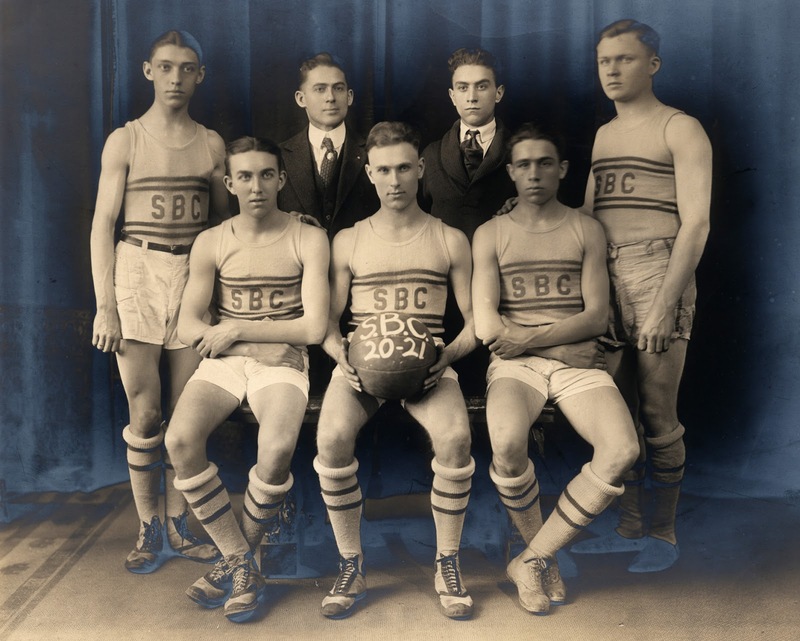 We must strive to do right and seek to be good. 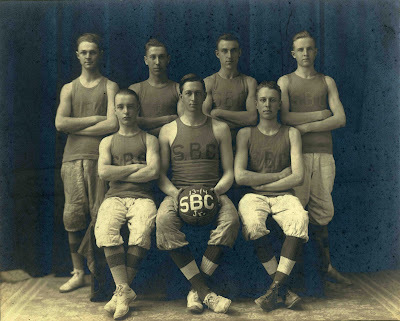 Judge E.B. Sadler passed away on March 25, 1888, just a few years after he penned this rhyme. 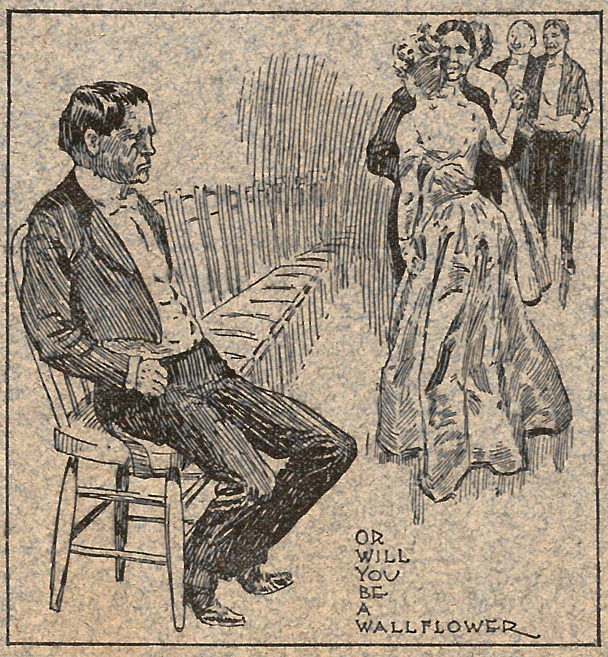 He was buried in Oakland Cemetery, next to his beloved wife Emily. that lives in my breast. of flowers and translate them. 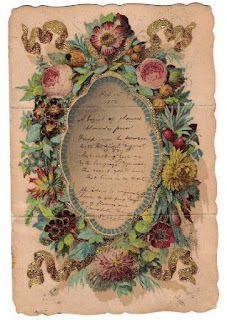 While we do not know who wrote the verse on the Valentine, it was given to a female named Jane. In looking at the 1920 U.S. Census, we see that Jane Coan was residing in the household of her nephew, George F. Anderson. 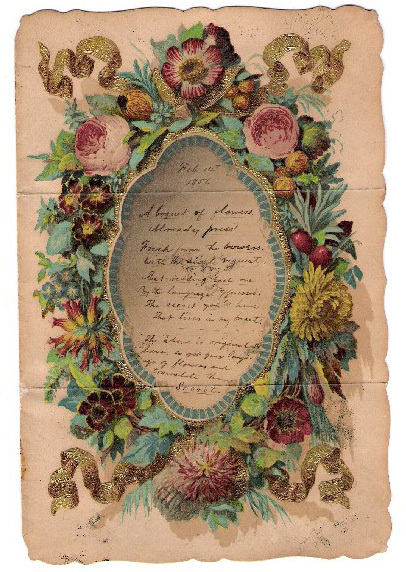 Most likely, George F. Anderson donated the Valentine to the Sandusky Library’s historical room after his Aunt Jane died in 1920. 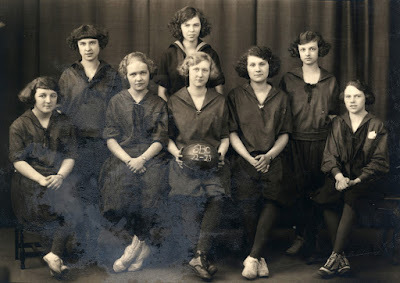 Jane Coan’s great grandmother was Abigail Kelley, who was a part of the Kelley family for whom Kelleys Island is named. 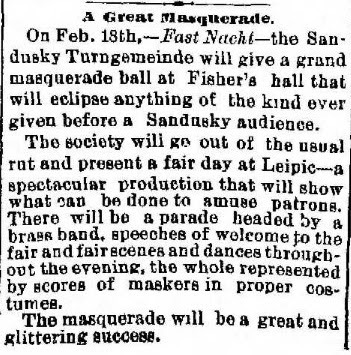 Adolph Lange won a prize of $6.00 for his costume as a Knight of the 16th century, which he wore to the masquerade ball held by the Social Turners in Sandusky on February 14, 1888. 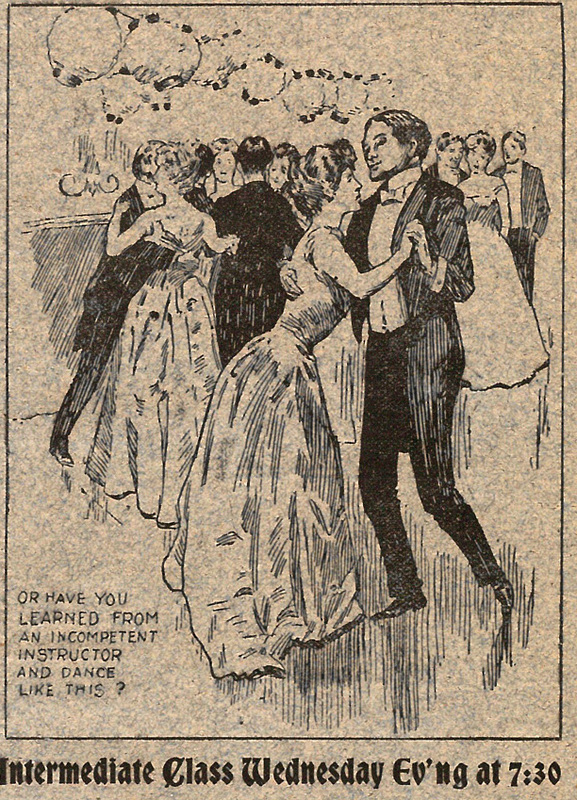 (Six dollars in 1888 was worth about $160 in today's money.) Masquerade balls and parties were held frequently in Sandusky in the nineteenth and twentieth centuries, often sponsored by local clubs, but sometimes held by private individuals. 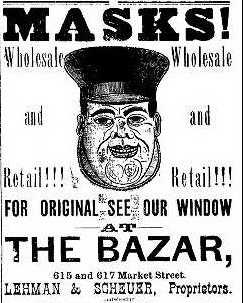 Just in time for the ball, masks were sold at the Bazar, a popular store in the 600 block of Market Street, to help shoppers complete their costume for the masquerade ball. 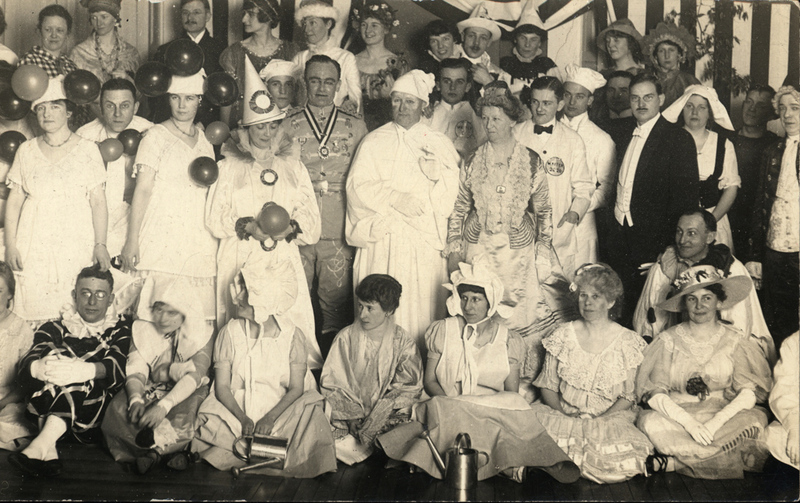 Several former Sandusky residents are pictured in this masquerade party held in the early twentieth century. 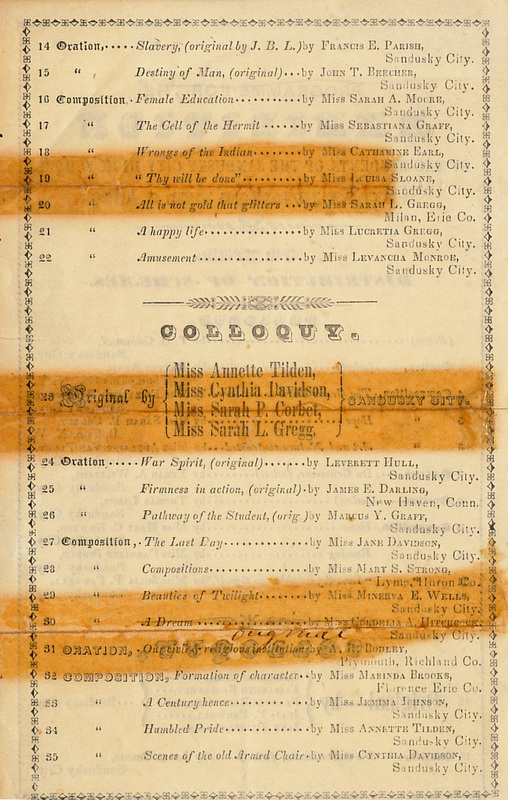 While we do not know the exact date or location of this event, the names of the individuals in attendance were: August Kuebeler, Mrs. Russell Ramsey, Mrs. John Mack, Mrs. R.M. 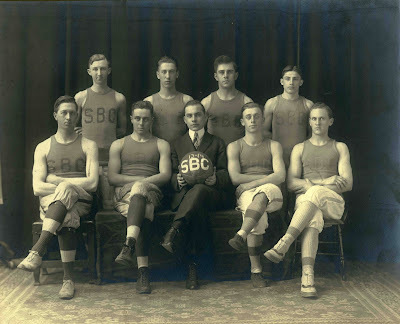 Taylor, Mrs. Clifford King, Mr. and Mrs. Ira Krupp, Clifford King, Mr. and Mrs. Merritt Wilcox, Mr. and Mrs. Phil Beery, Mrs. August Kuebeler, Mr. and Mrs. Watson Butler, George Beis, Mr. and Mrs. Curtis Brewer, William Kerber, Mrs. Thomas Sloane, Herbert Textor, Fred Harten, Mr. and Mrs. Harry Dunn, Carey Hord, Mrs. Brown, Mr. and Mrs. George Feick, Doris Marquart, Mrs. Percy Staples, Natalie Marquart, Gladys Rife, Mrs. John Britton, and Mary Vietmeier.